It’s been hard to continue my blog. My story just seems to continue without any changes. Same pain, same issues, day in and day out. It’s been very stressful, not just for me but for my family too. I now understand how relationships self-destruct with body pain and cancer being involved. Nonetheless I provide this update for you, my melanoma warrior, because there is help (and you’ll need it) and just because my story may not end well does not mean that your life will be cut short. Not by any stretch of the imagination. And for the sanity of those around you, don’t stretch your imagination. Love and caress each day and those closest to you. Remember, they need you just as much as you need them. My story picks up with my latest cancer checkup on February 14, 2011. It was discovered that I had a second tumor in my left eye. The proton radiation treatment I had in Oct 2006 was still working on killing off the blog vessels to that tumor. But a second tumor was discovered. Large but not thick, which as I write this is a saving grace, of sorts. If you’re ever offered this treatment option be sure to take the anesthetic offered. I didn’t, because of all of the pain killers I’m on anyways. And I really didn’t want another needle in the eye, having suffered through that with the Avistan treatments. But if you can imagine a knitting needle, heated to 400F then shoved in your eye, and still heated up more as it’s burning away in your eye for up to 60 seconds, and repeated 8 to 10 times (honestly I lost count) then you’ll have some iota of what I endured. Of course, this being an eye treatment you also have to “aim your eyes” to the proper point and keep them there for the duration of the single treatment period (again, for up to 60 seconds) to allow the laser to hit the correct place of the tumor as well as holding your chin in the stirrup and forehead in the brace. The first couple of times didn’t hurt much, and I thought to myself, this isn’t too bad a treatment. After the fourth time the burning was intense and after the sixth time I could barely sit still and almost passed out from the pain during the final four passes of the laser. Now, I’ve had really bad pain in my life, intense physical pain. Ruptured hernia, repaired and ruptured hernia after three months of the first surgery, smashed shins, bruised bones, and, of course, recuperating from the surgery of my eye being pulled from my head in preparation of the proton radiation treatment. This pain was worse, almost indescribable, apart from what I said above. Luckily for you, my dear warrior, I did not video the session, although looking back it woould be quite astonishing, to say the least. I might get a second chance though. I return to my doctor in 8 weeks and if this new tumor becomes untreatable then I will lose my eye, as in having it removed from my head. Or I might have the diode heat laser again, this time with the anesthetic. 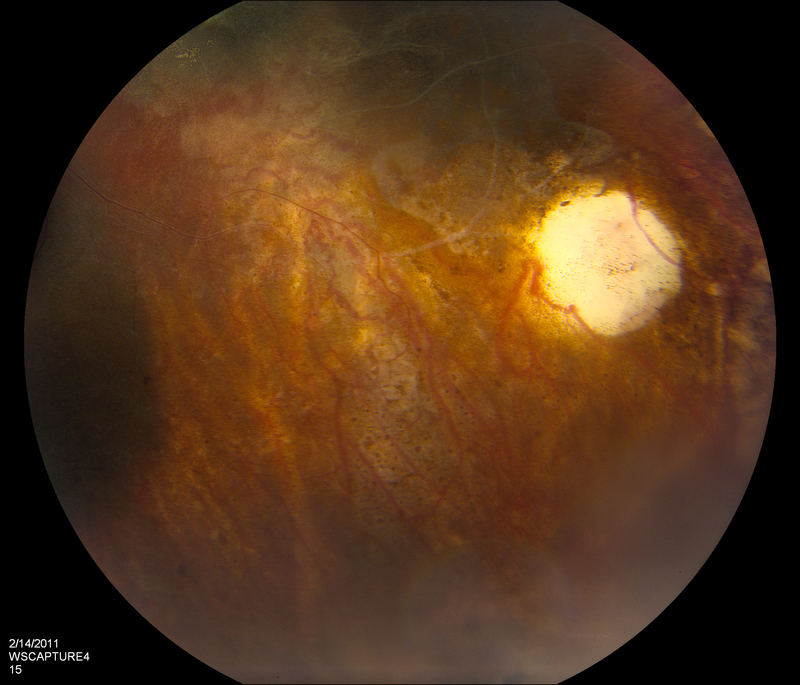 I do have some pictures of the new tumor, as taken during the “colour fundus imaging” and you can see the first tumor as well. Image 1- This image shows the first and second tumor. The first tumor is dark area center-right and to the left of the lighter glowing areas. The newer, second tumor is the large dark area on the lower-left area. Image 2- Reverse angle image both tumors. 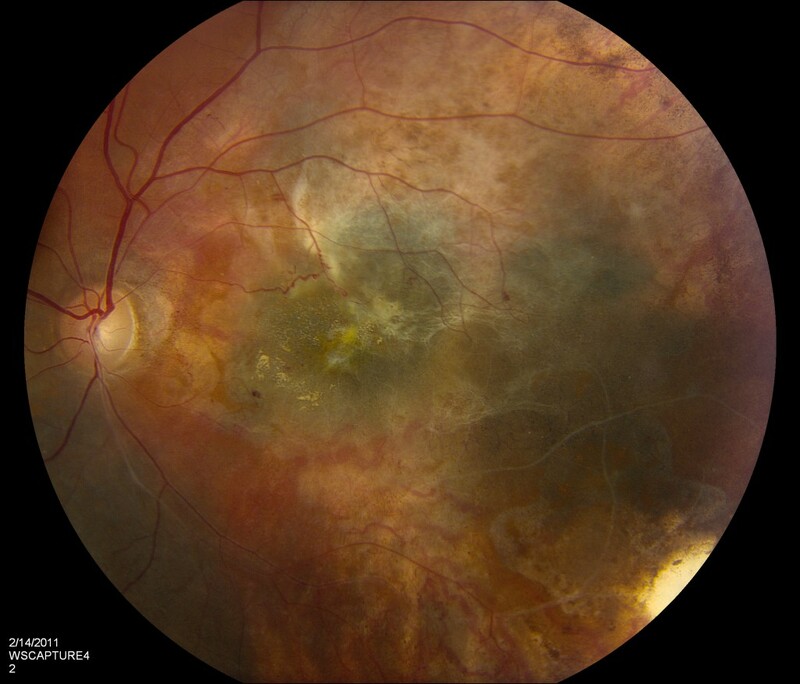 It is the dark areas that is the cancer, you can clearly see the larger blood vessels and other optic parts I do not know the names of. The first tumor almost looks like a zygot in the womb. The pupil is the very light area. Fascinating. 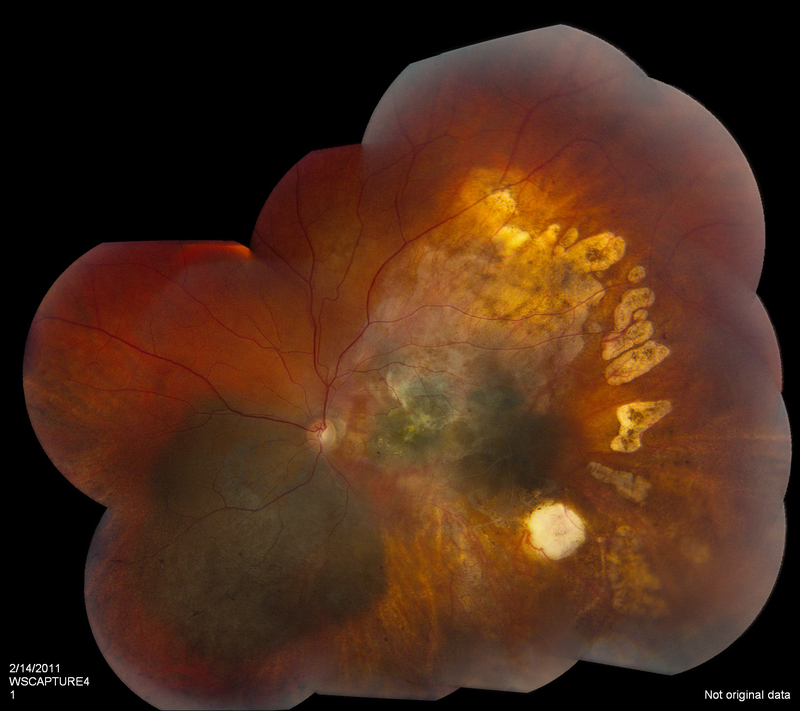 Image 3- You should know that over a dozen images were taken of the fundus, to allow for a 3 dimensional position of the tumors. This final image clearly shows the tumors in relation to the pupil, as well as the optic nerves and larger blood vessels. The pupil, the tumors and the larger blood vessels. I do not know what is ahead for me, but I am positive that whatever comes there is a purpose. That’s what keeps me from going completely insane, I think.